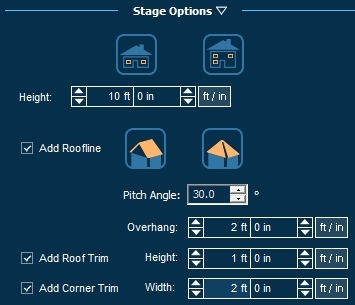 Custom houses can be created using the same drawing tools available in every stage. You can generate any number of structures, each at any height. This gives you the ability to create a two-story house with a one-story garage for example. One Story: Selecting this option will set the height of the selected house piece to a single story house. This control may be used in both 2D and 3D. Two Story: Selecting this option will set the height of the selected house piece to a two-story house. This control may be used in both 2D and 3D. 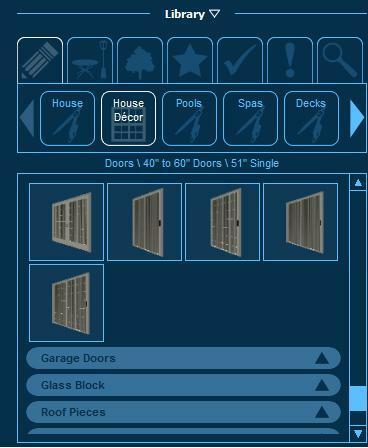 Height: This control allows you to set the height of the selected house piece. This allows for a custom height to be set for house, which is useful for setting the thickness of patio covers and house decks. This control may be used in both 2D and 3D. Add Roofline: Add a roof line to the selected House object. Pitch Angle: Adjust the angle of the roof line. Add Roof Trim: Toggle roof trim on the selected House object. Add Corner Trim: Toggle a vertical trim along outer corners of a House object. Once you have designed the basic outline of your house shape, you can add doors, windows, roof pieces and other items from the House Décor category in the Library. To add these items, open the Library to the category House Décor and select the item Type you would like. Select the item you wish to insert and either click the Insert button or double left click on the image of the item. When you move your cursor to the viewport, the door or window outline will follow until you left-click to place the item. 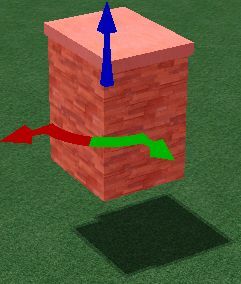 If you move the mouse close to an existing house shape with a house decoration selected, the decoration object will snap into the proper position. The elevation of shapes drawn in the House Stage can be set in the Panel under Parameters. You can control both shapes you have drawn as well as items inserted from the Library. Elevation Box: You can manually enter an elevation value for the shape or library item. Whenever you move an item in the 3D view, this option is automatically selected. With this control you can create patio covers, balconies, and other open space elements. This control can be used in both 2D and 3D. Elevated House Pieces: Elevated house pieces are used to create patio covers, house decks, and suspended objects with empty space underneath. House pieces can be elevated either with the 3D gizmo or by setting an elevation under Parameters. Parameters: The elevation controls under Parameters can be used to edit house pieces in 3D. As you change the settings, the selected pieces will change in 3D.